Taking on a retired Greyhound can be wonderfully rewarding but requires forethought, as sight hound specialist Jackie Drakeford explains. The working life of a Greyhound is very structured, and so changing to a pet environment can make them feel insecure initially, because they are used to routine. You can help the by making changes gradually while they adapt. Most new Greyhound owners understand that house-training will need work, and this is usually straightforward. They are naturally clean, and a simple process of taking them outside frequently to toilet, and rewarding them lavishly when they oblige, will soon see them clean indoors. Some take a little longer, and some male dogs will have to be watched for territory marking at first, but the majority get the idea quickly. You will be keen to take your hound out and show him to your friends. Exercise is important to Greyhounds, who are true athletes. Though built to sprint, they will enjoy as much exercise as you give them at slower speeds as well, so if you want a hiking companion, your Greyhound will love to explore with you. However, he may have had a spell resting or convalescing in kennels before coming home with you, and so be rather unfit, so build up exercise gradually. Be aware of old injuries which may cause long-term discomfort, as they do for us, and adjust his exercise to allow for this. Greyhounds are the only dogs who have specialist vets; while a small animal practice is still perfectly good for everyday treatment, there may be times when a Greyhound expert is worth consulting. There are certain significant differences between sight hounds and other types of dog and not all clinicians may be up to date with these. Particular care must be taken with sedatives and anaesthetic procedures. Because Greyhound heads are leaner than their necks, they can slip any collar easily, and many people choose to exercise them in a harness instead. Owners doing this must check daily for rubs, because Greyhound skin is soft and thin. Greyhounds do not usually pull, but they can go from a standstill to flat out in a couple of leaps if they see something to chase. Although they look delicate, they are very powerful, and so owners should never wrap the lead around their hands, because they can be injured if their hound suddenly moves fast. We have a natural tendency to hold the lead with our thumb pointing at the dog, but this gives a weak grip that is easily loosened. Instead, hold the lead the way horse riders hold their reins. From the dog, the lead should pass between your little and ring fingers, through the palm of your hand, upwards and out between your index finger and thumb. The end of the lead should go across your front and be held in the other hand. This gives a really strong hold with much reduced risk of damage to the handler. Never use an extending lead, which can easily break or pull out of your hand, causing a Greyhound to bolt with the handle in tow. Most Greyhound kennels recommend that new owners keep their hounds muzzled when exercising, and most owners aren't happy about this because they think it makes their dog look savage. But to a retired Greyhound, being muzzled has always been a happy event because it precedes going out, and they are perfectly content to wear one. New owners should not be in a hurry to discard the muzzle as it is there for the Greyhound's safety, plus that of other animals they may meet. Those long, elegant jaws might look flimsy, but they are very efficient, and Greyhounds can react first and think later if, for instance, a cat dashes across in front of them. 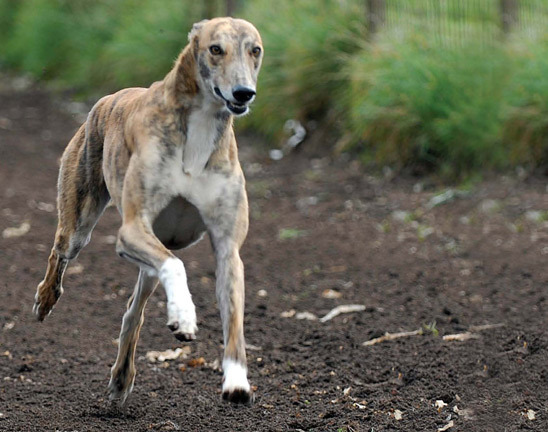 One of the first questions new owners ask is: "When can I let my Greyhound off the lead?". Though gentle souls with people, Greyhounds are predators just like any other dog, the difference being that their speed and instincts mean they can catch creatures that other dogs can only chase ineffectually. Though some owners may achieve a good recall after a lot of work, others may not, and there are very few dogs that can be called off once in pursuit. It is better to find safely fenced areas devoid of wildlife, where your hound can run freely, as often as you can. Greyhounds may never have seen other types of dog before, so be careful with introductions while your hound learns about them. A few Greyhounds will learn to accept small pets in their own household, but may want to chase if they see similar animals when out. If you go to classes, find trainers that understand a Greyhound's different physique. Their long backs make sit uncomfortable, and those deep chests make a down unpleasant. Moreover, sighthounds are not given to obeying commands they consider pointless, so regimented obedience classes are unsuitable for them. Greyhounds do have a lovely sense of fun, though, and will enjoy a gentler learning environment. They will also become used to other sorts of dog they meet there, though they don't like rudeness or bullying types, and owners should step in and end any interaction that starts to look confrontational. In the home, you will instantly know which furniture is the most comfortable because the Greyhound will be on it, often upside-down or poured bonelessly across like a Salvador Dali watch. If you prefer a dog on his own bed, make sure that bed is sensationally luxurious. Though they look lean and spiky, these hounds make devoted snuggling companions, and will enjoy a lie-in as much as you do! Higher red and lower white blood corpuscle readings. Extremely sensitive to all anaesthetics and sedatives. Not fast enough - but will still be very fast. Don't want to chase a lure - but may still want to chase wildlife. Injured - may be trivial or major. Too old - but will still have years of life left. Around 8,000 Greyhounds retire from racing each year; most are three or four years of age.